Released in June 1985, 'Soul passing through soul' was the second solo single by Toyah Willcox. Although Toyah was originally the name of her band (1979-1983), she continued with that name even when she went solo. Well, it was her own first name after all. While 'Don't fall in love', her first solo single, had been a success, peaking at number 27 in the UK singles chart, this one only reached number 57. Personally I think this is the stronger of the two - even the B-side is very good. Toyah's cover version of 'Echo beach' reached number 54 in the UK singles chart. Before I found the 12" single of this track, I found this limited edition picture disc 7" single, released in April 1987. One further single, 'Moonlight dancing', was released in 1987 without any chart success, before Toyah turned her attention to television and theatre. 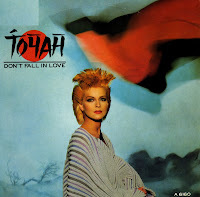 'Don't fall in love', released in 1985, was Toyah Wilcox's last top 40 hit in the UK, peaking at number 22. She'd had a lot of hit singles since 1977, when she started her career as part of a band named Toyah. A year later she married guitarist Robert Fripp. I bought this single because my sister said she liked the song a lot. Myself, I was more impressed with the colourful and visually striking cover of the single. 'Echo beach' was originally recorded by the Canadian band Martha & the Muffins in 1980. I liked that song a lot, and so it's no surprise that I would also be interested in cover versions. Toyah's version of the song was released in 1987, but I didn't find out about it until more than a decade later. That's when I found this 12" single.